From hole-in-the-wall pizza joints to fine diners and all the trattorias in between: here’s where to find the best traditional cuisine in Italy’s Eternal City. As any seasoned foodie traveller will tell you, a trip to Rome is incomplete without indulging in carbs, Italian-style – you know, the world’s best pizza, pasta, focaccia bread dipped in balsamic vinegar? The city serves up a maze of authentic and traditional restaurants to discover one bite at a time. From the cheap and cheerful to the inventive and the elegant, here’s your guide to finding Nonna-approved dishes that you must eat, when in Rome. Hidden in the warren of cobbled streets, Piccolo Arancio (meaning ‘small orange’ in Italian) is a well-concealed gem of Roman cuisine. Featuring two wide doors opening onto the narrow street, locals can be spotted dining at dusk within a quaint, quintessentially Italian, interior – chequered table cloths and all. This restaurant is a local favourite located only a two-minute walk from the Trevi Fountain. While the location is prime and the design is delightful, at this venue, the pasta is the real star. Try the house-made, Nonna-style fettuccini, penne, lasagne and ravioli, which draw a huge following. For a mouth-watering feast, order the orange ravioli with ricotta, orange juice and zest or the cacio e pepe, a typical Roman pasta dish served with only pecorino cheese and cracked pepper. With a wine to suit every pasta base, this is the perfect place to seat yourself for a night of fine, and immersive, Roman dining – right in the heart of Rome. Also a stone’s throw from the Trevi Fountain, La Fontana di Venere is what might happen if Nonna met up with Heston Blumenthal. The pasta here is naturally made in-house and dishes sport some incredible inventive flair: try the risotto with scallops in vanilla for an unlikely, but utterly surprising combination. Similarly, let the flavours of succulent lamb and saffron cream dance around your mouth with the cannelloni dish or try the ‘little bundle’ of phyllo pastry, buffalo cheese and crispy prosciutto with basil cream. An added bonus of La Fontana di Venere is the traditional Roman design: pale pink walls, ancient Roman art replicas and a classical-style statue displayed as a centrepiece. Situated in Ostiense, an up-and-coming formerly industrial neighbourhood, this pizzeria feels a lot more like a cafeteria than a fine-dining experience. You’ll find exposed brick walls, old fashioned tables, colourful wooden chairs and almost fluorescent lighting – but boy, can they make a pizza. Expect thin pizza bases, limited toppings (in true Italian style) and a bucket load of flavour. Order the zucchini flower pizza with mozzarella and anchovies or the classic Margherita with buffalo cheese. The real crowd-pleaser, however, is the capricciosa with the unexpectedly glorious combination of boiled egg, mushroom, artichoke and prosciutto. With wood-fired bases and expert chefs preparing them, every pizza on the menu promises to be as delightful as the last – just make sure you book enough time in Rome to try them all. 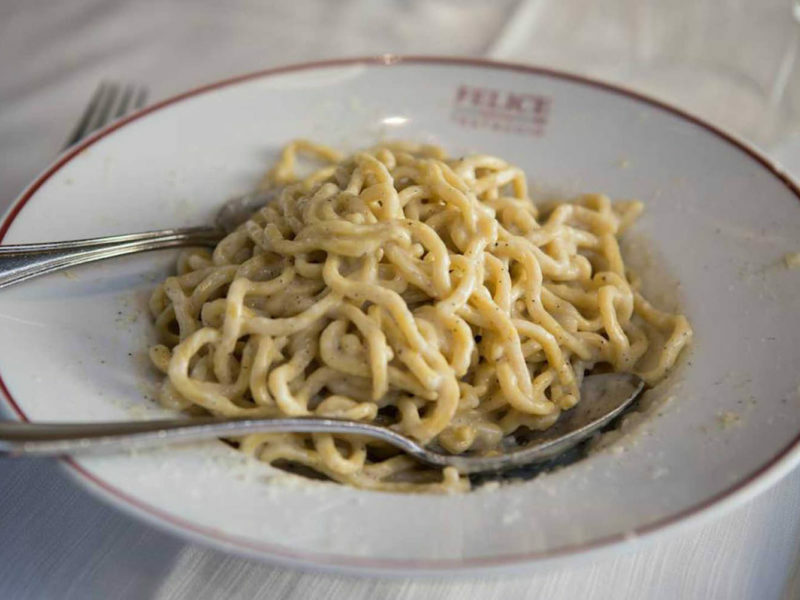 Traditional Roman cuisine is best had in the exposed brick and chequered-floored interiors of Felice a Testaccio. With a menu that changes depending on the day of the week, expect to feast on spaghetti with bacon and egg yolk on Mondays, ravioli with cherry tomatoes, herbs and ricotta cheese on Thursdays. Try something very unique (if you’re game) on Saturday, with rigatoni served with pajata (the small intestine of a dairy calf – a traditional Roman delicacy). Characterised by a hole in the wall and a cow mat, this pizzeria is an unlikely local favourite, boasting some of the best home-style pizza in Rome. Pizza is charged by weight here, so you can take full advantage of the variety on offer. Options include the usual suspects and more: think Margherita, eggplant and mozzarella, salami, four cheese, and potato and rosemary. But do not leave the establishment without ordering some supplì (a magical combination of fried risotto rice stuffed with mozzarella cheese). Most options come in at a grand total of €1.30 per 100 grams, meaning a kilo of Rome’s best pizza will only set you back $20. With a Michelin star, views overlooking the ancient city of Rome and red roses and wine buckets adorning the white linen-clothed tables, Imàgo is proof that Nonna has a very fancy side. The menu is equally as impressive as the establishment, with rabbit and scampi ravioli, fettuccini quail ragout served with pecorino cheese and caviar, and the carb-on-carb dish of pasta and potatoes with baby crab. This is the perfect place to sip on a glass of red between bites, as you look out upon the curves of the pantheon in the distance.